Graphic Art by Kenneth K.
Welcome to a brand spankin’ new edition of the CR Weekly Newsletter. It’s been a week of fruitful developments for the Cyber Republic and Elastos ecosystem. Elastos came out with a new website that has been a hit with community members. New supernodes are featured in our follow-up piece. Rong Chen recently spoke at the annual Token 2049 conference and last but not least, Hyper Connect’s proposal has officially been the 2nd funded project through the new CR Consensus model. Before we move on to the news, we’re proud to say that with the expansion of our team, CR Social Media presence has been growing at a rapid pace. Each Weekly CR Newsletter has more than a dozen people working on it, and because we’re always seeking a higher level of content, we’ve a sparkly new e-mail address: press@cyberrepublic.org. Leads, progress, submissions, questions and comments can all go to this address. We also have a new medium page. Follow it for a regular release of articles: https://medium.com/@CyberRepublic. Recently, the Elastos Foundation came out with a new website. Its clean and organized layout is easy to navigate. You’ll find a newly created Team Page, something the community has been asking about, and the “2018 End of Year Report” is prominently displayed along with a devoted section for developers, how anyone can get funded on the CR, and a link to the Elastos Wallet. There are clickable graphics on the Elastos Blockchain, Elastos ETH Sidechains, and Elastos Runtime and Carrier. Below these are Industries the Elastos technology has use cases for as well as links to the Elastos Ecosystem’s tools and the Cyber Republic itself. We always have more submissions coming in so we’ll be sharing them as well. From West to East, the community is seeking help secure Elastos’ DPoS Consensus mechanism. There are funded projects such as DMA and Hyper Connect that are looking to run Supernodes. The various admins also have mentioned running a supernode. Our goal is to create an educational resource for community members to be informed and vote with conviction. Elastos Founder Rong Chen spoke at the Token 2049 Event. He was on a panel with other projects such as Icon, Ontology, Aion and Wanchain. Rong spoke about the high-end Elastos technology, specifically about the sidechain structure, runtime that’s made up of Virtual Machines, and the Cyber Republic ecosystem. It’s always great to have the leader of the Elastos Foundation attend high-profile events and representing the ecosystem. Lastly, Hyper Connect became the 2nd project funded through the CR Consensus. This is an open source IoT framework that utilizes the Elastos Blockchain and Carrier, amongst other ELA services. Their goal is to provide a modular and feature-rich platform that can be used in any IoT industry as well as for personal use. This is another big step in the Cyber Republic ecosystem. Hyper Connect gathered the second-most votes behind the React Native project. Look out for a roadmap from the team; we are all looking forward to seeing the CR-funded product built from the ground up. Congratulations to Peter Strauss and the Hyper Connect team! The team is mainly composed of developers and a member with a background in Electronics, Embedded Systems, and Measurement/Controlling Systems. They will create their own website, twitter account, and Telegram channel to market the Supernode. The makers of the popular Elephant wallet and the admins of Elastos Telegram will jointly be hosting two nodes. Both of these groups of people have been crucial in developing tools for a robust Cyber Republic community. 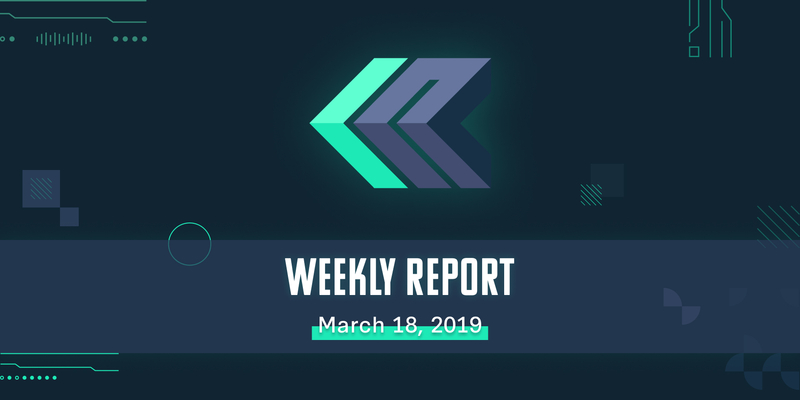 Please tune-in to the following Weekly Updates to get more information on these Supernodes. Their mission is to run three Supernodes (SN) with a very fair reward and highly competitive distribution that’s primary purpose is to contribute to the ecosystem in a sustainable way. The three SN’s will be named Callisto, Ganymede, and Titan, after the biggest moons in the Solar System, and each node would be run in a different continent as the team is composed of members from several countries: U.S.A., Morocco, New Zealand, England, Germany, and Belgium. This will ensure diverse distribution of the Supernodes. In terms of developing a script to streamline the payouts, there are experienced coders and programmers in the pool that will take care of this code and ensure that it’s 100% conducted through smart contracts and scripts. They are also considering using the open-sourced script by Strauss after its development. Also, prominent CR member Michael S. has a personal Supernode he’s hoping to run from his hometown in Houston, Texas, and he looks forward to contributing to the DPoS Consensus. The team plans on utilizing an open source solution that the whole community can use when it becomes available. Damiano is very active on social media as he manages several groups with around 20k members; he is the admin of Elastos Italia. With his active channels and social outreach, the team feels very confident that they will promote their supernode effectively. This group prioritizes transparency and communication with the community and looks to act in the best interests of the Cyber Republic ecosystem. This is a diversified group of 15 members who are looking to run three nodes in the U.S.A. Their other members are from France, Netherlands, the United Kingdom, Australia, and Canada. Their values in 5 words: Empathy (genuine human interaction), Grit (results come from mistakes) , Patience (because fast and good don’t coexist in perfection), Wild Actions (actions are better than words), and Fun (life is a game). Another prominent community member looking to run a Participant Supernode is Brian from the DMA project. He shares his thought process in hosting a node and what their prerogative will be for the community: “As the Supernode election is nearing, myself and the team were thinking about whether or not we needed to participate, and how we would go about doing this. This is clearly a very important step for the Elastos infrastructure and community, so we decided to have an internal discussion of the qualifications needed to run an elected Supernode. The team is reaching out to the community through all the proper social media outlets along with potentially creating a website for his group’s candidacy. If interested, they invite community members to join their node. You can reach the team at supernode@elastosdma.org. One of the most active CR projects, DMA, has just come out with their most recent team update. For those who don’t know anything about the project, DMA is built on the Elastos framework and focuses on the decentralized digital marketplace; it is a business commerce domain. There are multiple layers to the project with a lot of different use-cases. We’ve covered DMA in previous editions. DMA has provided updates on their Early Access Program, Phase II Plan, Uptick e-ticketing dApp, Translation tools, and their Metro dApp. They are picking three to five community-driven projects and they will provide these projects technical support. The EAP hopes to get DMA business development in local regions, but the submissions should focus on current tokenized asset management areas such as: event tickets, vouchers, gift cards, and various other digital rights. The submissions can be related to any opportunities related to copyrighted digital content, data driven advertising, and targeted marketing, which is the focus of DMA 2.0. Typical use-cases for DMA 2.0 will be music, video, artwork, video games, data asset management, etc. DMA has received 20 inquires, mostly from the Chinese community. Most participants have shown interest in Community Operation and dApp development. DMA will support some of those inquiries, as stated by the team: “…we have decided to provide limited support to several dApp projects. They will cover event tickets, gift cards, vouchers, etc. The final dApp list will be posted by the end of the month. The first round of dApp partners includes ‘Uptick’ team, and several Elastos eco-system teams.” DMA is very pleased by its interest in the Chinese and Asian markets along with the progression of the English community is expanding at a good rate. DMA’s most current dApp is called Uptick. It’s an E-ticketing dApp that contains multiple modules for businesses to utilize in their respective jurisdictions. It was just released March 13th. There have been updates to the platform as well that include usability enhancements, bug fixes, and refined language. The Uptick app now automatically updates to the newest version. They are working on making Uptick ready for commercial operation. The team is confident they will get the proper support and funding in order to commercialize the Uptick platform. Uptick will increase earnings for businesses without the use of a 3rd party and will decrease the ticket prices for consumers, a win-win for both sides. DMA has also come out with a web translation tool for the Uptick dApp. This will help adoption in multiple countries and cultures. It is a generic tool that also be available to any other dapps that need multiple language translation support. The team plans to continue to polish the tool, and they will share it with the community as soon as possible. Metro app already boasts more than 500,000 users and the team has come out with several updates. The team’s statement on Metro app is, “Metro app is moving forward as usual. We will start a spring campaign in April. The Metro team is evaluating the opportunity in several international cities, such as Singapore, Bangkok, Toyko, etc. It will grow in parallel with DMA project development.” We all look forward to the campaign in April. Thanks to DMA for providing detailed updates on its framework along with its multiple dApps. The community is looking forward to seeing more progress for one of the most exciting projects in the Elastos ecosystem. How can blockchain help the medical industry? How can Elastos benefit health care providers? What is the most impactful part of Elastos on medicine? Chinicci always eager to share his excitement for Elastos. Elastos Runtime can be thought of as an App Engine or a Virtual Machine(VM). It is a sandboxed runtime environment that runs on top of an existing OS, such as Android, iOS, Windows, etc. Dapp developers do not need to worry too much about the technical details of the layer underneath (blockchain layer). They just need to call the RT.SDK. Building dapps becomes much easier than before. Dapp developers use ionic to develop their HTML5 applications that will run on trinity browser. Non-Elastos apps can access the Elastos Smart Web via the RT SDK(C++ SDK) because android and iOS apps can call C++ SDK. In this way, Elastos’ versatility and ease of use presents a powerful appeal to existing mobile developers. Elastos Runtime runs on the user’s device to achieve a “reliable runtime environment.” By developing Elastos dapp, independent developers can use digital assets such as digital audio and video playback. VM guarantees digital assets will run under blockchain control, providing users with the ability to consume and invest in digital content. A runtime system is the bridge between hardware and software in that it translates code into machine code. Elastos Runtime is the environment that code can run on–much like an encyclopedia or a library about a new world in which digital assets are run under the blockchain. Elastos Runtime, essentially, is what decides what to do with the instructions in a code. On March 15th, Kevin talked to the community regarding CR Preparatory Committee on Huobi Chat. Feng Zhang was on the Chinese Telegram chat sharing his views on community governance and ecosystem development on March 17th. Brian, Lead of Elastos BizFramework (DMA) Team, has published a great article on China Metros discussing the value and applications of blockchain in urban rail transit. Passengers of metro services represent a huge customer base. Passenger-centric operations and business models will be the main developmental focus in the future. Blockchain ensures data is personally owned and the smart contract guarantees that profits can be managed automatically and distributed to the relevant parties in real-time. Brian and his team have, as a pilot test, released tokens to the Metro App users and have quickly acquired several loyal users. The users gain tokens when they travel by trains and they can use the tokens to purchase goods in shops and vending machines within the stations. The application of the digital tokens can also be extended to offering discounts in metro ticketing and shops outside the stations, as well as with precision advertising. To learn more about the details of the idea, read the Chinese article here: https://mp.weixin.qq.com/s/0tfE4bkFypTNBc8xELl7cQ. Would you mind introducing yourself and how you found Elastos? Hi, I’m Chris and I am an Elastophile. I’ve worked in defence, security, operations and communications for over 20 years. I studied Psychology at University and now have a MBA and a Masters in International Relations & Strategy. I have an entrepreneurial mind and learned of Bitcoin in 2011. I loved Satoshi’s vision but was not technically skilled to set up mining, and I kick myself for not working harder to understand it. I learned of Elastos in 2017, was delighted to hear of Rong’s vision, and I invested in early 2018. If I knew how to be, I’d be a CypherPunk. We’ve heard that you’re going to be part of a new suggestion for the Cyber Republic. Would you mind introducing that and what it hopes to accomplish? Who else is on the team, and what is your role? I met with many from the core community in Thailand last summer and have kept in touch. There is such an eclectic and talented mix. Inspired by what Aryan (IoeX) and Brian (DMA) are doing, and having seen Elastos products and services mature, I have been itching to help Elastos grow. I have recently joined a small group from the Elastos community to build a European Business Development hub for Elastos. Our working title for this new venture is Elastos Orchard. We think this reflects the sustainable, nurturing environment that we wish to create, within which there will be other elements which we’ll describe soon. Europe is an amazing marketplace and we believe that Elastos needs representation here. Our focus will be based on 4 pillars: educating potential developers, influencing policy makers, supporting start-ups and connecting investors to blossoming projects. So far, team members include: Jochem (Netherlands), Diego and Rachid (France), and Ghandi (Switzerland). We are recruiting a lady from Germany too. Rachid is the co-founder of AllianceBlock.io and we intend to form a strategic partnership to accelerate our own development. We look forward to answering questions and securing votes from the community so that we can take this idea onwards. You’re clearly someone who believes very much in the Elastos vision. However, even with the significant price difference from your initial investment, you have a positive outlook. What in your life has equipped you for this, and how does that connect to how you see Elastos? Where are your doubts? Like many, I didn’t want to see the bull market price rises of 2017 for what they actually were. I learned a lot. We all have our moments of doubt but I remain calm, pragmatic and determined because Rong & Feng’s idea is sound and the fundamentals continue to improve. Every week Elastos core-developers and Elastos affiliates deliver against the plan. There is so much going on, it’s hard to keep up – but exciting. My philosophy is simple: If I don’t understand something, I learn; if I don’t like something, I try to change it; if I make a mistake, I admit it and move on. And I only invest in projects that I care enough about to help. I have doubts and they relate to how Elastos manages the transition from the idea of a traditional, centralised company to a novel, distributed, community-driven organisation. This is hard work, especially when so many have invested to make quick money. However, I believe many more invested in Elastos because of the philosophy and we need to listen to them; this is a unique, long-term project that will change the world for the better. As it does this, all those who’ve contributed by investment or effort will be rewarded. Concerning the Cyber Republic, what insights do you have to share with the community, and in the same way, what insight do you wish to share with the current interim council members? Cyber Republic is a fantastic tool, but it needs adoption, too. We have to encourage people to come off Telegram and put their ideas into Cyber Republic forums. This is a behavioural change for all of us, so we need to think about how we incentivise it. Ideas include: a competition to bring people to CR and to complete their profiles; explainer videos as to how to use CR; the requirement to hold at least 1 x ELA to contribute (to increase the quality of posts); updates on social media channels to inform of new idea submissions and film stories of the most successful submissions. In addition, there should be options that allow people to find others, by geography, skill-sets or ideas. Do you seek a greater role in the Cyber Republic? If so, what is that role and what would it offer the Cyber Republic and Elastos? Yes, if I could find a full-time role in Elastos or the Cyber Republic I would jump at the chance. I’d like a role such as global marketing or operations manager to cohere all the efforts of the core-team and affiliate businesses within a strategic plan. Maybe that’s something I could do within Elastos Orchard. I’d also like to write Rong Chen’s biography. Lastly, why do you sound so intelligent and thoughtful and interesting even when you ramble on within a video for 20 straight minutes…twice? Where can we learn to do that? Are you going to lead the speaking workshops for Cyber Republic ambassadors? Ha, funny! Perhaps, after the Bill Bryson book, I should have called those YouTube videos ‘Notes from a small ELAnd’? I learned the importance of good communications in the British Army. This is true whether you are trying to get a new idea into the head of an old general or whether you are giving commands in combat. I have given lectures to different audiences around the world and know that speaking clearly, and telling stories with energy, are the best ways to achieve understanding. It’s only with understanding that you can achieve effective actions. I’d love to teach the ambassadors programme about running Elastos meet-ups and how to seek the change they wish to see.